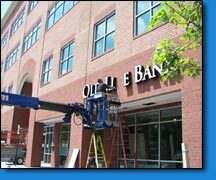 Maryland Washington DC Virginia Sign Installation | KERLEY SIGNS, INC.
Our Installation experts have undergone rigorous training in order to ensure that your sign meets or exceeds all building codes and zoning regulations. 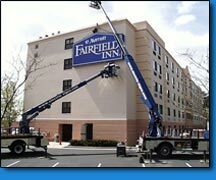 All of our crane trucks are fully equipped in order for Kerley Signs to handle a full range of maintenance and repair tasks at any given time. 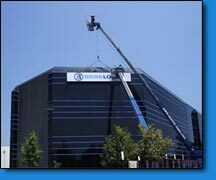 We have all the equipment necessary to ensure your new sign is expertly installed and securely attached to combat nature's effects. 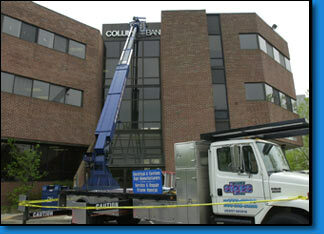 Extending one of our crane trucks to install a set of channel letters at the top of a four-story building.